We are working closely with PSE&G. They inform us that the Madison St and Marshall St substations are flooded and will be de-energized (shut down) soon. Much of southern Hoboken will be without power. Charge phones, lower temp on fridge & keep closed. There are also multiple live wires in the street. For your safety, please stay inside. Talking Ed Note: Pass this on! The Hoboken Police Department is reporting it has lost power. The City of Hoboken has experienced severe flooding in excess of the record set in 1821. The city is working closely with PSE&G to resolve power outages. According to PSE&G the substations at Madison Street and Marshall Drive are flooded and need to be shut down. This will result in the loss of power to much of southern Hoboken. Residents should not approach any wires or touch anything touching the wires including water. Residents should stay out of flood waters, which are a mixture of sewage and rainwater and pose a health hazard. Strong winds have brought down multiple trees and flood waters have displaced man hole covers. It is very dangerous outside so residents are strongly urged to stay indoors. A mandatory curfew remains in effect until 1 p.m. Tuesday. 11th and Washington - power is down again on Washington Street even though light on side street is visible. An unconfirmed police rumor that criminals are attempting to organize looting using social media to create "flash mobs" after the hurricane. 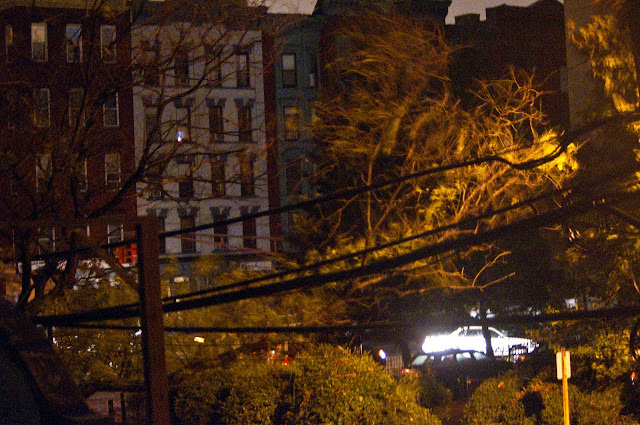 10:10 PM Southern Hoboken unconfirmed power now down. Marine View out.